Our world has drifted frighteningly far from the flower power vibe of the 60s, but if you’re longing for a return to the hippies, I know where to find them. They’re on the sunny, relaxed Balearic Islands of Ibiza and Formentera, just off the south-east coast of Spain. Formentera in happy, hippy droves. They bought old farmhouses and set up impromptu markets, selling everything from home-grown vegetables to hand-strung beads. It was a blissful escape from the world then and, the good news is, it still is. 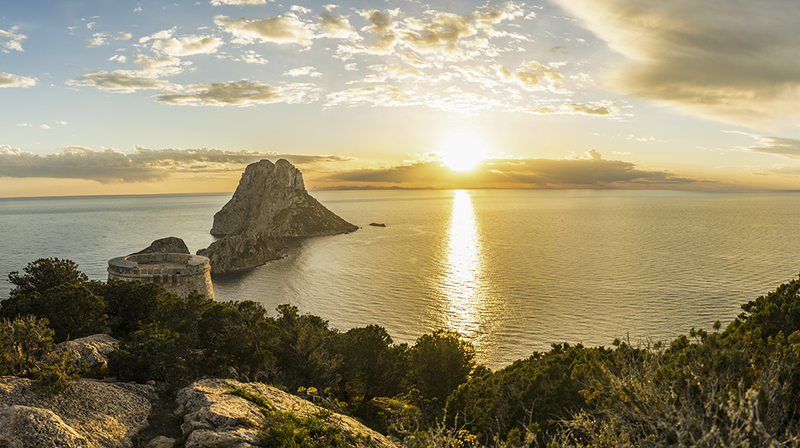 Sunset on mysterious Es Vedra island. 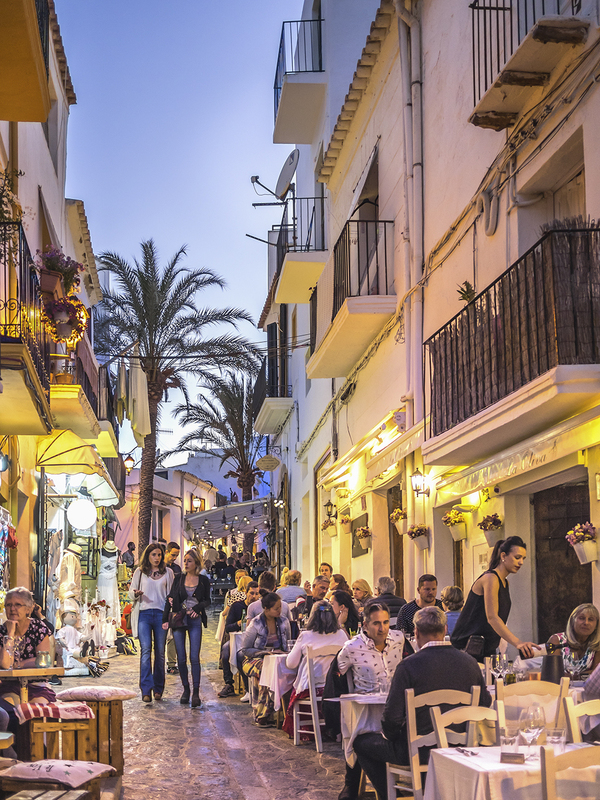 Today, hippy markets, organic restaurants, a boom in agro-tourism and a generally laid-back lifestyle mix with the old stone buildings, rugged cliff faces and white sandy beaches of the island to make Ibiza and Formentera perfect escapes from the madness of the world. There, both the people and the climate are warm year-round – with the temperature rarely dipping below 15 degrees C even on the coldest days. It’s a getaway from which you might never want to return. Toby Clarke, owner of the popular tour company Walking Ibiza, is the perfect example of a man who couldn’t resist the pull of the island. Born on Ibiza to counter-culture British parents, he spent his childhood happily roaming the beaches and attending an independent school run by hippy families. The smell of pot, he says, brings back fond school day memories! The cliffs and rugged terrain of the island were seriously challenging, but Clarke decided to make things even tougher by taking along neither money nor provisions. “I thought I could rely on the generosity and hospitality of Ibizans,” he said, and it turned out that he could. Throughout his multi-day trek, Clarke was welcomed, fed and sheltered by strangers – and that kindness convinced him to found his tour company, Walking Ibiza as a means of sharing the unique island vibe and promoting his home to others. While it’s possible for the ambitious visitor to do a week-long camping trek (note: food and shelter are provided – no cadging meals or beds from strangers required), shorter, less strenuous hikes are also available. I spent a glorious afternoon with Clarke and wife Belinda, hiking to the top of a cliff to view the small, mysterious Es Vedra island at sunset. Though it’s said to have magnetic properties similar to Machu Picchu and Sedona, what I felt was the pull of its beauty alone. As we walked, Clarke pointed out fascinating treasures I’d have strolled right past, such as an ancient shelter – a circle of smooth rocks where a tired shepherd would have rested for the night as his sheep grazed nearby – and a sort of kiln where fires blazed hot enough to melt rock into the white, limey substance used to cover and protect farm houses and sheds. Medicinal plants, edible berries… everything we passed was the inspiration for a story from Clarke, but best of all were his memories of growing up wild and happy on the island. Though his parents ultimately fell out of love with each other and the hippy movement, Clarke’s heart remained in Ibiza. It’s easy to see why. There’s a gentle sense of welcome everywhere you turn. I biked the quiet roadways, kayaked the spectacular shoreline at Benirrás Beach, and experienced the warmth of an agro-tourism inn at Cap Gazi, where a working farm has been transformed into an elegant retreat, complete with a horizon pool, spa, gym and outdoor yoga pavilion. The farm provides the freshest possible produce and the chef creates local dishes with flair. One wet evening, I drove across the island to the weekly hippy market, half expecting a plasticized, tongue-in-cheek spoof of the sixties, but what I found was anything but. A field full of tarpaulin-covered booths sheltered a group of serious artists –silversmiths, leather designers, potters and more. Hand-embroidered necklaces hung beside shaggy sheepskin vests and fringed bags that had a definite Mamas and Papas appeal. Everything had a vintage feel – except the people. Not leftovers from the age of Aquarius, these artists and vendors were latter day hippies – young Ibizans who’ve embraced the peace and love philosophy of their parents and spun it into a vibrant new lifestyle. Although the capital city of Ibiza is known for its hot clubbing scene – arguably one of the most famous in Europe – which starts at midnight with internationally renowned DJs keeping the dance floors packed until sunrise – it’s a relatively isolated phenomenon. Though I enjoyed my night of euro-cool living and loved the over-the-top amenities of the ultrachic OD Talamanca Hotel, where the beautiful people recuperate around the pool in preparation for the next night’s excesses, I was happy to find that driving five kilometres outside the city took me back decades in time and lifestyle. In the countryside, there are no jam-packed highways and few overcrowded resorts. Instead, a sense of peace descends as you roll along two-lane roads, through tranquil farmland, heading for some of the most beautiful beaches in Spain. If Ibiza is laid back, Formentera, her sister island located just a short ferry ride away, is even more so. With just a few main roads and almost no stoplights, Formentera is a place that you explore slowly and savor joyfully. You could easily bike the whole island and many visitors do. The small beach town of Es Pujols is a favorite escape, where you can stay at the friendly, family-owned Hotel Sa Volta, then enjoy fresh caught fish at the Capri, another family-owned establishment where the owner himself comes out to make certain that you’re enjoying every bite. Be sure to try the Formentera salad – a delicious mix of bread, dried fish, and tomatoes. You’ll be back for more the next day! Because the island is so small – just 20 km long and two km wide at its narrowest spot – the ocean is always with you. Don’t resist her charms – surrender yourself to the waves. My most fabulous morning was spent sailing a catamaran with a friendly local guide whose English was not much more extensive than my Spanish. It didn’t matter. We had the sun on our backs, the wind in our sails and the brilliant blue water all around us and as we crashed through the waves, salt spray in our faces, I understood not only what brought the hippies to these islands more than fifty years ago, but also what lures the rest of us here to share it with them today. 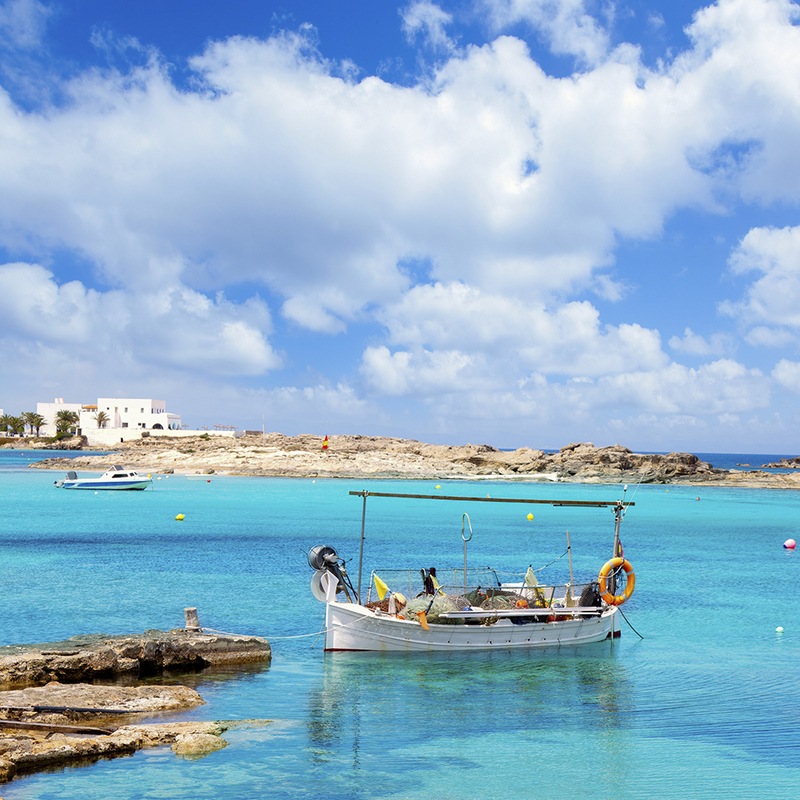 IF YOU GO For more information on Ibiza and Formentera, visit spain.info/en_CA. To book a tour with Walking Ibiza: http://walkingibiza.com. Written by Liz Fleming. Originally published in Cruise & Travel Lifestyles Spring/Summer 2018 issue. Photos courtesy of: Bay and beach at Cala Tarida – Sack/iStock; Es Vedra Island – Bartu Juan/Shutterstock; Ibiza Old Town - STBAUS7/iStock; Es Pujols – Tono Balaguer/Shutterstock.